There is a lot you need to know before considering buying an Eclectus Parrot. Buying an Eclectus Parrot is not something you can or should do randomly. To have the best start with the bird it is important to gain as much basic knowledge as you can before you get the bird. If you don’t research properly or just buy on a whim there is a much greater chance that you will set yourself and your bird up for failure. There are a lot of recommendations for this bird because of what is said about their wonderful behaviours and how easy they are to care for. Their behaviours and care can be very rewarding if you already know as much as you possibly can to start with. These birds are easy, as long as you know what you are doing with them. It is a good idea to research over several months at the least before considering this bird. The more research you do the more prepared you will be. Eclectus comes from the word eclectic because of the colouration of the male and female. The females are mostly red with a black beak and males mostly green with a candy corn beak. Until the mid 1960’s it was thought the male and female Eclectus Parrots were two different species of parrot. Eclectus require a great deal of room, therefore need the largest possible cage you can afford. Their wing span can be quite big so a cage horizontal in size is also important. 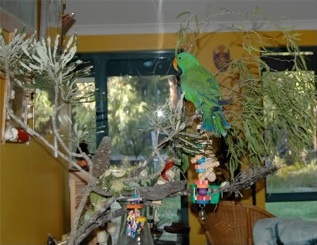 A macaw size cage is a preferable size for the Eclectus however you can go slightly smaller. 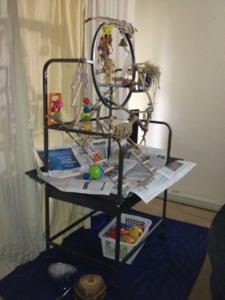 A play stand can be optional but most Eclectus caregivers find it is a must have for them. thoroughly enjoy rummaging through one. will keep them busy. The Eclectus is a very independent bird if given the opportunity. very healthy for an independent species as it can cause some behaviours. Bathing or showering should be encouraged on a daily basis. At the very least they should be bathed 3 to 4 times a week. Since the Eclectus usually like to soak themselves thoroughly, it is recommended they’re bathed early in the morning so they have the day to dry themselves off properly. They can take some time to dry and early bathing can prevent them getting too cold. It is OK to bathe them in winter. Don’t slow the bathing down because it cools down. Allow them to have the baths or showers they want and need and allow them to have the rest of the day to dry off properly. The Eclectus noise level can vary. Some people say they're noisy while others say they're a quiet bird. Generally speaking the Eclectus as a species are considered a quiet bird, but there is no guarantee you will get a quiet one. After all they are a parrot and they do like to screech for fun. The Eclectus is a very good imitator and if you have a fairly noisy household, kids, pets, neighbours, even noisy wild life such as native birds and parrots. All these can set the Eclectus Parrot off to screech as well and it is something you will need to accept. The Eclectus is capable of imitating these noises but they will sound much louder indoors. Their intelligence and talking ability rivals the African Grey. They can learn words and phrases fast and are able to put them into context. The Eclectus usually prefer to talk rather than screech. Some that are confronted with noise in the household that they are not in the mood for, will cause them to fly away from that noise and into a quieter area or room in the house. 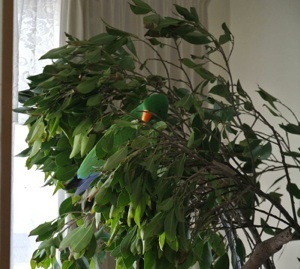 Other Eclectus Parrots will join in the noise, compete with the noise and can become a lot noisier. If you have an Eclectus that like to communicate noisily, buy yourself some earplugs. The Eclectus often come across to people as a lethargic, boring or an aloof bird. They appear to behave like this when they’re nervous or frightened and in unfamiliar surroundings. 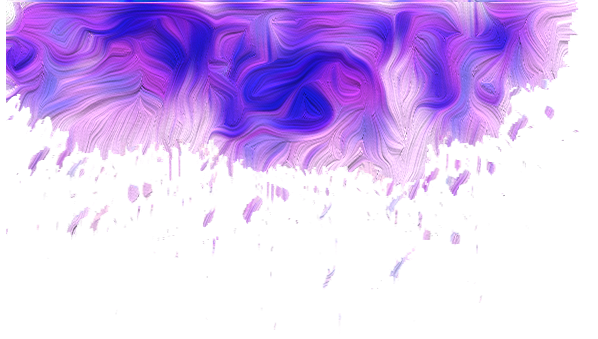 As they adjust they do come out of their shell and become more themselves and outgoing. When this happens you will be pleasantly surprised by what they can do and what they’re willing to do. People often presume their Eclectus is never frightened because they have never seen them suddenly take off with fright. The Eclectus is not known for the "Flight or Fight" that is commonly seen in other parrot species. Instead they often do the “Eclectus Freeze”. When frightened they are known to become completely motionless however, there are always circumstances where they will take flight as well, so don’t rely on the Eclectus Freeze. They can still take flight suddenly. Eclectus should be allowed approximately 10 to 12 hours of sleep per night. They’re not known to become grumpy from lack of sleep and although 10 to 12 hours of sleep is recommended, in the wild parrots don't sleep a solid 10 to 12 hours. Their sleep is very broken and since there are predators around. They will make up for the lack of sleep by napping through parts of the day. This occurs in both wild and captive parrots. Eclectus Parrots are great to train without using any food as a reward. They love positive attention and thrive on pleasing us, so this makes training very easy to do. Good behaviour should always immediately be rewarded with positive praises or extra play time, cuddles or even a small treat. Persistence with doing this usually pays off well as you will end up with a very happy and cooperative bird. The Eclectus is relatively easy to train because they can be so willing to please and love to have their minds kept stimulated. Tap water contains many chemicals in it which can cause health problems in parrots as well as burn them. There are also specific days when chlorine has been added to the water supplies, making the tap water stronger than usual. Some tap water can also be distasteful to parrots and they may refuse to drink it. Rainwater, bottled or filtered water are recommended and their drinking water should be kept clean. Distilled water should not be used as normal drinking water. Distilled water has no minerals that filtered, tap or bottle water has as it's all been removed. Because the water has no minerals it should never be use as drinking water. Stainless steel food and drink bowls are a preferable choice than plastic bowls. Over time E-coli is able to embed itself into the plastic no matter how often you scrub your bowls. Nothing can remove E-coli once it’s embedded into any porous materials such as plastics and wood. E-coli cannot embed itself into stainless steel, though you still need to keep stainless steel bowls clean and fresh. If you use plastic bowls they should be scrubbed daily and replaced every few months. Eclectus Parrots are better with a wide food bowl because they like to beak through their food to pick something out to eat. If their bowl isn't wide enough they will toss the pieces of food onto the floor to get them out of the way and to get to the food they want to eat. Later they usually will go down to the floor to find the food they had thrown out previously. They also need their water checked regularly as they enjoy dunking their food into it, causing the water to spoil quickly. Beak and nail Care can be done by offering a variety of branches, different sizes and textures. Some Eclectus may require a beak or nail trim but most don't. 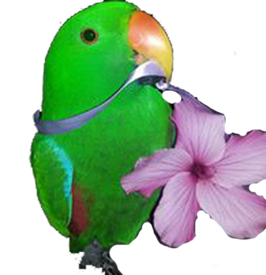 If you find your Eclectus is needing a beak or nail trim you need to take it to an avian vet to find out why. Most that require a beak and/or nail trim may have some underlying health issue that needs to be addressed immediately. To rule this out a vet trip should be done. Eclectus Parrots can occasionally be a lazy chewer. Some prefer to play with other things than chew wood, foot or chew toys. Doing this will keep your birds beak trim and in good condition, so try and encourage your bird to use the right toys and things to chew and rub their beaks on. Eclectus parrots also like soft toys and are often given them by their caregivers. This can cause some problems if they become a little obsessed over them or learn to only play with these, not only can they become a health hazard but they can also stop using the more natural things they would normally use to keep their beaks trim and healthy. Toe nails can be easily kept trim by having the right perches available. Avoid using dowel perches bought in shops. Perches should be natural and vary in thickness and length. 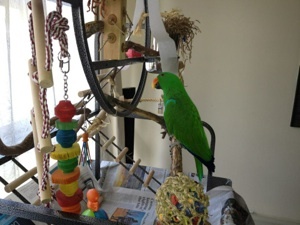 If you're able to supply your Eclectus stands and cages with very thick to very thin perches, not only will this help to keep the nails trim but it will help them to strengthen and give your bird the opportunity to have full use of it's feet, muscle up, have good balance to hang onto anything. There are mineral perches, cement perches, sand perches. These are OK to use, if you really think you need to. They're not necessary if you have the right natural perches. And these types of perches should never replace natural perches. Most people who have these perches only have one available to their birds. The perch should never be placed in a spot where your parrot is most likely to spend most of it's time. The spot that your parrot spends most of it's times should have a natural wooden perch that should be rough, not polished and thick enough that your bird cannot wrap his toes around entirely. The toes wrapping around ½ to ¾ of the perch is fine. If you look at the way the toes are wrapped around the right thickness perch, you will see the the feet look comfortable wrapped around & the toe nail tips are hitting the perch, keeping them trim and filed. Roughness of perches helps to keep their feet healthy and used to different sizes and shapes. Using smooth perches, one size perches only or cement, mineral, sand perches only can cause sores to develop on their feet. Sandpaper perches, there are 2 types. The first is like the sand perch or mineral perch and is considered OK. As with the rest, use them as an occasional perch, not to replace real perches. The second is sandpaper that wraps around dowel perches. This product should never be used. It is and probably always will be for sale in pet shops. It causes sores on your birds feet. The bird can also ingest the sandpaper causing health issues. There are occasional parrots that do require a beak and/or nail trim either only once or regularly. You can clip or file. My preferred method when needed is to file. You can use any nail file or emery board to do this. It's less invasive than clipping and you don't run the risk of cutting too much off, causing bleeding. Filing the nails down will also blunten them a little so they're not so sharp. If you choose to clip their nails you can buy the correct clippers at a pet shop or veterinary. Or you can use ordinary nail clipper, they work just as well. Only clip a tiny bit at a time, be sure to not clip too much off. If you're not sure about doing this or your bird is too uncomfortable having this done then take it to an avian vet or have a friend who knows how to do this help you. Exercise is essential for all Eclectus Parrots. A healthy Eclectus should be full of energy and on the move, look bright and alert and take a great interest in it's surroundings. 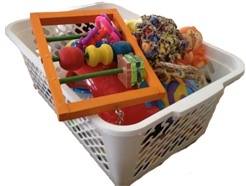 Give them a play gym and room to move, plenty of toys and a toy box. An Eclectus that has not been offered these things at a young age will may become a perch potato and not know what to do with toys or become afraid of them. Eclectus Parrots have an odour and a lot of people say the Eclectus odour is not like any other parrots odour. Most people say their birds odour is either sweet like honey or musky. The odour smell can also have a lot to do with your own sense of smell as well as what they have eaten. If your Eclectus has eaten a piece of fruit then they're likely to have a sweet smell to them. More seed and pellets offered can give a musky smell, and if you give them a sliver of raw garlic they will smell like raw garlic! Some people have said Eclectus odours seem stronger during their hormonal periods as well. I haven't noticed this smell myself. A very young and scruffy Eddie on his first play gym. 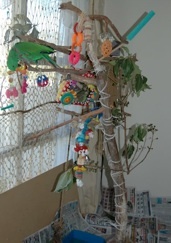 It changes all the time with various toys and safe branches and leaves. The first gym is his home gym and made from a dead gum tree. The second was his holiday gym, built from Banksia and Peppermint tree, when he visited Yallingup. The third picture is his toy box kept with his gym. TIP: research, research, research!! Never stop researching on these birds. Even if you think you’ve read enough and know enough, there is always new stuff popping up on the internet that you should know about, so never ever stop researching your bird.